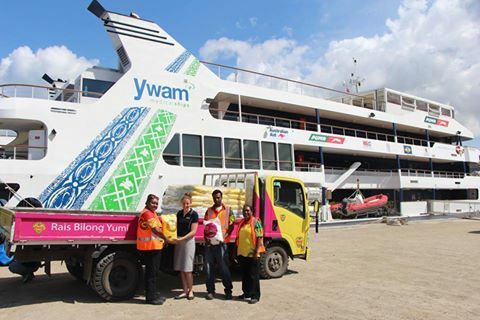 Trukai has again thrown its support behind The YWAM Medical and Training Ship which performs vital medical services and training in remote areas of PNG, by donating 1 ton of rice to feed the ship’s many volunteers. The donation comes in the form of 100 bags of 10kg bags of rice. The YWAM Medical and Training Ship, called the MV YWAM PNG, was back in Papua New Guinea running clinics in Gulf Province and Port Moresby before commencing an outreach to Milne Bay Province, followed by Western Province. Youth with a Mission (YWAM) is a worldwide Christian movement operating in more than 180 countries since 1960. With previous donations of this magnitude made by Trukai to The YWAM Medical and Training Ship, Ship Manager Jeana Wiemeyer expressed her gratitude for the company’s ongoing support. “YWAM again gives heartfelt thanks to Trukai for its generous donation of rice. We will certainly put it to good use and are grateful for the continued partnership that our two parties have forged,” Ms. Wiemeyer said. With 43% of the population under the age of 15, one in four Papua New Guinean children will not live to celebrate their 40th birthday. Delivering basic health services in Papua New Guinea poses enormous challenges with 84% of the population living in remote, rural areas scattered over rugged terrain, complex river systems, vast expanses of ocean, and an extensive coastline. MV YWAM PNG helps overcome the challenge by accessing isolated communities with medical specialists, supplies, health services and mentoring and support for rural health workers.